Studies confirm what many of us already know – that a white set of teeth and a great smile makes people seem more attractive and can lead to increased success at work, in love, and with first impressions. Researchers from the universities of Leeds and Central Lancashire took pictures of models and then digitally changed the colour of their teeth. Three shades were used – a yellowish brown, healthy white, and startling white. The showed the resulting photos to 150 young women and men and requested they rank the models. As we might expect, yellow teeth were least popular. And this kind of result is found in study after study, and people with attractive smiles do better with first impressions, job interviews, dating, and even how much pay they are offered when they are hired. Teeth whitening is a safe, non-invasive and simple process that lightens the shade of your teeth and brightens your dull smile. At Warner Lakes Dental, we can help chase away discolouration ruining your smile. With teeth whitening options, your teeth can be bright and beautiful again! Extrinsic stains are on the surface of the enamel, which is quite easy to stain. Staining can be caused by tea, smoking, chewing tobacco, and drinking coffee. Dark-coloured foods and beverages, including colas, red wine, dark sauces and fruits including blueberries, grapes, and pomegranates, can also stain teeth. These foods and drinks contain high levels of chromogens, which both produce pigment and stick to tooth enamel. Foods and beverages with high acid levels can erode the tooth enamel and make it easier for chromogens to have their adverse effects on teeth. Severe enamel erosion can increase the chance of teeth sensitivity. Intrinsic stains are inside the tooth. Medications can often cause intrinsic stains. Even drugs we think of as safe, including, Albuterol, antihistamines, and blood pressure medications, can lead to stains. Excessive fluoride. We often think of fluoride as a friend to teeth, but the yellowing of teeth from too much fluoride (fluorosis), often occur in regions where the drinking water has high levels of natural fluoride. Interestingly, dental materials can cause also cause stains, particularly silver fillings (amalgam). Genetics can also affect the shade of teeth. Some people are born with naturally thin enamel, which allows the yellowish colour of your dentin to sneak through. Age can also cause thinning of enamel, which makes your teeth yellower. Poor health is also implicated in poor teeth colour. High fevers at a young age, severe neonatal jaundice, Sickle Cell Disease, and trauma can lead to yellowing in teeth. We offer two paths to whiter, brighter teeth – Zoom Whitening and Take-Home Whitening. Zoom Whitening. Zoom whitening gives the most dramatic results possible. 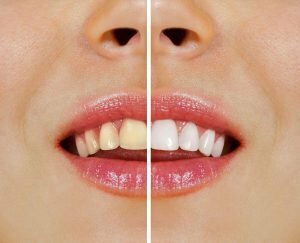 In 45 minutes to one hour, your teeth can become up to 8 shades whiter, reversing years of stains from food, drinks, aging, and some kinds of medication. Zoom Whitening begins with your dentist checking to see if you are a good candidate, then checking the current shade of your teeth to ensure there will be a dramatic difference after your treatment is complete. Your mouth is prepped for whitening a layer of advanced whitening gel is applied to your teeth. To accelerate the whitening process, we shine a special lamp onto your teeth that that accelerates the whitening process. This process is repeated times and can be completed in as little as 45 minutes! Once you’ve reached your desired brightness, post-treatment gel will be applied to reduce sensitivity and protect enamel. You’ll leave the dental chair with an instantly brighter, more confident smile. If you choose home whitening, you will be sent home with a take-home maintenance kit that helps you maintain your new shade at home. Home whitening is equally simple and allows you to whiten your teeth at the comforts of your home! Get your teeth whiter and keep them that way! Our dentists at Warner Lakes Dental are experts in teeth whitening procedures. If your teeth have no deformities in their structure and you only want to enhance their colour, then teeth whitening may be right for you. We only use safe and high-quality products to guarantee that you will achieve the smile of your dreams. Many of our patients at Warner Lakes Dental have left the clinic with new, bright smiles on their faces. Warner Lakes Dental works hard to make your visit the most convenient and quickest experience possible. From our parking lot to our dental chair, we make the entire process a painless and straightforward. From the simplest checkup to root canals, dental implants, and cosmetic procedures, Warner Lakes Dental is your partner in dental health. 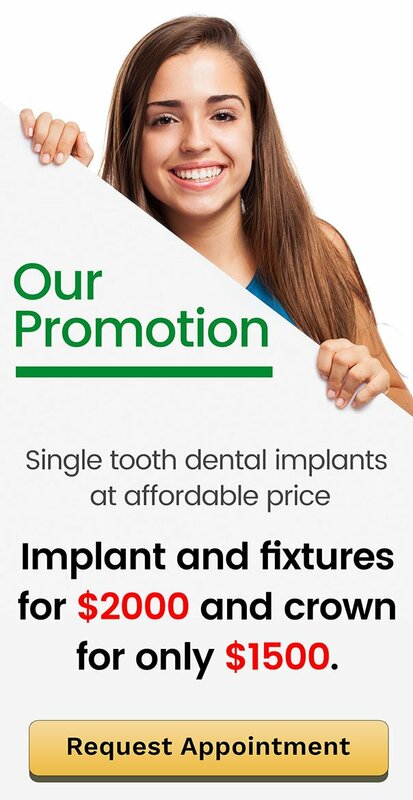 We offer you and your family a chance to enjoy life with a stunning smile and healthy mouth, teeth, and gums! Warner dentist also serving local communities in Whiteside, Cashmere, Bray Park, Albany Creek, Brendale, Strathpine, Joyner, Griffin, Lawnton, and Petrie. Warner Lakes Dental is offering a promotion on teeth whitening! For more information, call us on (07) 3448 0162 or visit us online. We are located at Warner Lakes Medical Precinct, 1185B Old North Road in Warner. Ultimate Toothpaste Guide: How to choose? Warner Lakes Dental Tips: Are Dental Implants Really the Best Solution for Missing Teeth? © 2019 Warner Lakes Dental. All Rights Reserved.